(Nanowerk News) Researchers from UPM have taken the first steps towards the development of a sensor for the detection of bacterial meningitis in real time by combining gravimetric sensors with synthetic antibodies giving, as a result, a sensitive, rapid and affordable method. In order to develop early diagnosis methods of bacteria diseases, the team of researchers from Microsystems and Electronic Materials Group (GMME) at Center for Advanced ICT Materials and Devices (CEMDATIC) of Universidad Politécnica de Madrid (UPM) has published a work to explain the first steps towards the development of a biosensor for the detection of bacteria associated with bacterial meningitis. In this way, researchers used gravimetric biosensors combined with aptamers that act as receptors. This method is more rapid and affordable than the methods used today, and they could be used in health care centers for early diagnosis of bacterial diseases. a) Scheme of the transversal section of the transductor. b) Plain view photo of a chip with four resonators. The bacterial meningitis is among the top 10 causes of death due to infectious diseases worldwide. About 10% of patients die within the following 24-48 hours after onset of symptoms, and 10% to 20% of the survivors of this disease present long term neurological damages. Besides, bacterial meningitis is easily spread through coughing, sneezing or close contact. These issues make essential a rapid and accurate diagnosis of the disease in order to provide patients with adequate treatment and prevent a possible epidemic. The bacteria most commonly associated with bacterial meningitis are the meningococcal and pneumococcus, but its early clinical diagnosis is often nonspecific, and this makes difficult the rapid identification of the bacteria, being critical for an appropriate treatment of the outbreak. Today, the diagnosis confirmation is often based on methods that last too long or are expensive and require the intervention of highly qualified personnel. Being aware of the situation, CEMDATIC-UPM researchers aimed to improve the diagnosis of these types of diseases by using sensors that allow them a faster, cheaper and more sensitive diagnosis. Therefore, they used label-free biosensors for direct detection of whole bacteria. The label-free gravimetric biosensors consist of electroacoustic resonators based on two basic elements. The first receptor is a material able to fix the species to be studied selectively and efficiently, in such way that its weight increases proportionally to the concentration of such species in the fluid to be analyzed. The second element, the transducer, is in charge of measuring the variation of the weight of the receptor when detecting the species. 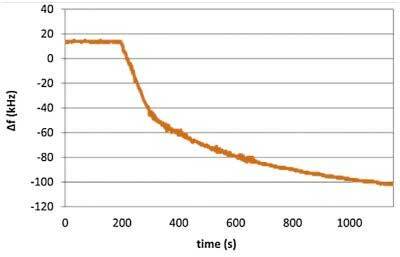 Evolution of resonance frequency of a gravimetric sensor upon a protein binding. The biosensor developed by UPM uses aptamer as receptors since they are a very attractive alternative when it comes to replacing the antibodies for the biorecognition of species in affinity biosensors. These receptors are very chemically stable, synthetics (against the antibodies developed in animals) and selective (they can be designed specifically for each species). Besides, they used gravimetric sensors as transducers based on high-frequency shear mode thin film resonators. This biosensor is an interesting alternative because of its high sensitivity, low detection limit, and low cost. Researchers have confirmed the effectiveness of this new method by testing, through the measurement of the variations of the resonance frequency of the gravimetric sensor, that the biosensor is able to detect specific proteins of bacteria causing meningitis in exceptionally low concentrations. According to the researchers, this work paves the way towards the development of rapid, affordable and very sensitive biosensors for the detection of bacterial diseases. This will improve the early diagnosis of this type of diseases which is a key aspect to avoid serious complications. José M. Escolano, Bárbara Díaz-Durán, Mario DeMiguel-Ramos, Jimena Olivares, Morten A. Geday, Enrique Iborra. Selection of aptamers to Neisseria meningitidis and Streptococcuspneumoniae surface specific proteins and affinity assay using thin film AlN resonators. Sensors and Actuators B 246 (2017) 591–596. Mario DeMiguel-Ramos, Bárbara Díaz-Durán, José-Miguel Escolano, Mariano Barba, Teona Mirea, Jimena Olivares, Marta Clement, Enrique Iborra. 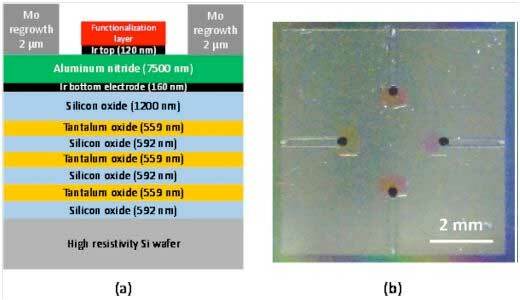 Gravimetric biosensor based on a 1.3 GHz AlN shear-mode solidly mounted resonator. Sensors and Actuators B 239 (2017) 1282–1288.